In “Distributed Lethality and the Importance of Ship Repair,” Christopher Cedros identifies the critical and much neglected requirement for improved ship salvage and combat damage repair in support of the new naval surface ship warfighting concepts. However, he fails to take his analysis to its logical conclusion. Salvage and battle damage repair are only part of the broader logistical requirements for conducting distributed lethality. To keep the full naval battle force forward in a sustained sea control fight, the fleet requires improved forward, mobile maintenance capabilities to maintain its complex technology and equipment even before enemy actions take their toll. It also requires forward, mobile resupply capabilities to maximize the effectiveness of the combat logistics force (CLF). These routine sustainment functions are critical generate the necessary and unrelenting combat power inherent in the distributed lethality concept. During a naval conflict against a competent adversary, our forward, fixed (and mostly foreign) infrastructure is equally at risk for conducting battle damage repairs as well as for conducting necessary ship maintenance and resupply by the combat logistics force. If forward facilities are not available for these critical tasks, what will take their place? Will combat and support ships have to transit back to U.S. bases thousands of miles away, sapping the force of its strength and lethality? What will be effect on the ability of the fleet to generate necessary combat power for naval maneuver warfare? In some ways we are entering a “back to the future” moment. There are many parallels to the operational and logistical challenges the U.S. Navy wrestled with during the last sea control contested era. An in-depth understanding of the challenges, dead ends, and experiential development of workable logistical solutions during the period 1899 to 1945 provides critical insights for developing contemporary solutions to analogous problems. The development of a highly effective mobile fleet train (with its apex during the final two year years of the Second World War) increased the sustained readiness, availability, range, and operational mobility and flexibility of the fleet’s combat power, and enabled it to conduct effective naval maneuver operations. Fundamentally, naval maneuver—something that has not driven fleet design during almost 70 years of U.S. naval supremacy and is much more than benign naval movement—is based on the ability of the naval forces to generate overwhelming operational tempo and a series of dilemmas for the enemy that shatters his cohesion through a multiplicity of rapid, focused, and unexpected actions. When naval maneuver is part of closely coordinated joint operations, it creates a turbulent and rapidly deteriorating situation for adversaries from which they cannot effectively cope. Generating and sustaining this necessary tempo requires keeping more ships in the fight longer, sustaining their maximum warfighting capacity, and delaying the fleet’s culminating point as long as possible. The logistical functions of supply and maintenance (to include salvage and repair capabilities) are critical to achieving this advantage. If maintenance and supply functions had to depend primarily on combat ships transiting to secure established bases and shipyards located thousands of miles away, the fleet’s available combat power would be significantly reduced and a competent naval enemy could react more effectively. Initially after Pearl Harbor, the Navy employed pre-packaged base sets—including land-based shops, machinery, buildings, warehouses, fuel tanks, piers, airfields, hangars, and other facilities labeled Lions, Cubs, and Acorns—at advanced bases to provide logistical capabilities. However, the deficiency of these expeditionary, but fixed, sites was quickly found to hamper plans for more dynamic operations that required greater maneuver. A more mobile afloat logistic force that had its embryonic start before the war, and could more closely accompany the fleet, was greatly expanded and included a significantly increased number of new construction and converted tenders, repair ships, floating dry docks, provision and cargo ships, ammunitions ships, refrigeration ships, hospital ships, oilers and tankers, station tankers, distilling ships, survey ships, salvage ships, submarine rescue ships, lighters, barges, tugs, floating cranes, floating barracks, and floating dry docks. The service forces’ squadrons (i.e., the fleet train) moved forward rapidly as the offensive progressed, operating shortly after advanced bases were secured at atolls and sheltered waters. 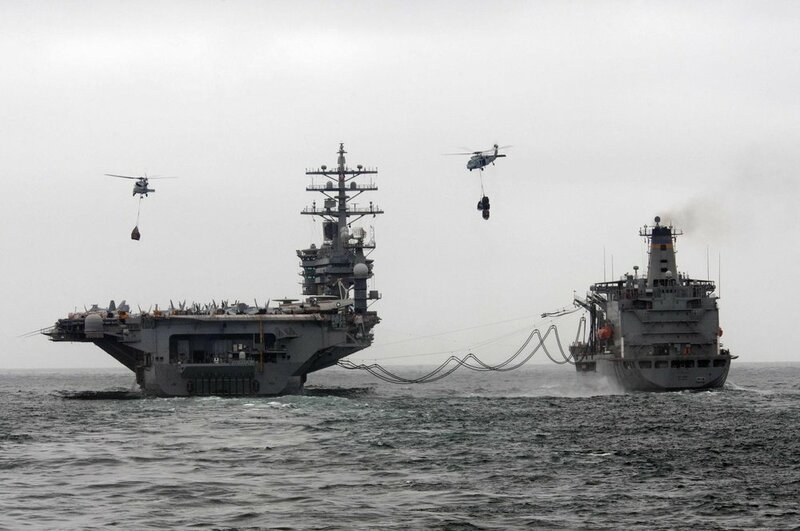 A full-fledged underway replenishment (UNREP) squadron was also established. It operated with even greater mobility, in close proximity to the main battle fleet as it operated against the enemy, providing fuel including aviation fuel. During the last nine months of the war, underway replenishment equipment and procedures were also developed for transferring ammunition and provisions. These enhancements gave the fleet extraordinary endurance and sustained lethality compared to the beginning of the war. The UNREP squadron, the forerunners of today’s Combat Logistics Force, rotated ships back to the mobile logistics force squadron operating at the forward advanced base for resupply. The combined effect of this extremely efficient logistics infrastructure is often forgotten in the more dazzling accomplishments of integrated carrier, submarine, surface ship, and amphibious operations. The combined effect of this extremely efficient logistics infrastructure is often forgotten in the more dazzling accomplishments of integrated carrier, submarine, surface ship, and amphibious operations. However, it formed the firm foundation on which swift and highly lethal naval maneuver warfare was generated and sustained. The resulting overwhelming sea power victory was in many ways a product of forward and mobile logistical superiority that enabled highly capable combat forces to unleash unrelenting power on, over, below, or from the sea against the Japanese. The general trends in achieving this critical logistical superiority were to move from fixed logistic sites ashore to more mobile afloat capabilities operating as close as possible to the maneuvering operating forces of the fleet. Following the war, however, economic constraints and the strategic opportunities of secure forward logistical facilities diminished the apparent need for mobile logistical capabilities beyond underway replenishment of naval forces conducting presence and power projection operations. The end of the Cold War accelerated these trends. However, changes in the operational environment require a reassessment. Established Fixed-Based Support: Shore-based at secure bases/shipyards (CONUS/Hawaii/Guam/Allied facilities if available). Expeditionary Ashore-Based Support: Ashore-based expeditionary facilities (like the Lion/Cub/Acorn concept from the Second World War) transported to and erected at expeditionary advanced bases. Modular capabilities that can be employed either afloat or ashore like on the T-AVBs could be used. Mobile Afloat-Based Support: Mobile afloat-based facilities/capabilities at advances bases in sheltered waters (like at atolls). A more mobile dry dock or cofferdam might also be developed. Underway Sea-Based Support: Underway sea-based facilities/capabilities (UNREP-like capability) that are part of the Combat Logistics Force and operate in open ocean environment. Beyond fuel, ammunition, and general supplies, increased use of maintenance teams and 3-D manufacturing might be employed here as well as salvage capabilities. Experience teaches us that effective naval maneuver warfare requires secure, forward logistics functions able to fully sustain the readiness, availability, range, operational mobility, and lethality of the fleet’s combat power. These capabilities are more than just salvage and battle repair. As the maritime environment becomes increasingly contested, understanding how to leverage technology and employ enduring concepts to provide today’s distributed and lethal naval battle force with the full breadth of required logistical functions is critical to generating overwhelming operational tempo. Wes Hammond is a retired Marine officer. He is a graduate of the U.S. Naval Academy and the Naval Postgraduate School. He served in Operation Desert Storm and commanded an artillery battery during the amphibious landing into Mogadishu, Somalia. Before retiring from active duty, he was an analyst in Headquarters Marine Corps’ Strategic Initiative Group and director of the Commandant’s Staff Group. He currently works as a DoD analyst and consultant. Cedros, Christopher, Lieutenant, U.S. Navy, “Distributed Lethality and the Importance of Ship Repair,” The Strategy Bridge, 14 February 2017. The following provide more in-depth understanding of the development and employment of the mobile fleet train during this period: Cunningham, A.C., Civil Engineer, U.S. Navy, “The Movable Base,” U.S. Naval Institute Proceedings, 1904, Vol. 30/1/109; Ellis, E.H., Captain, U.S. Marine Corps, “1. Naval Bases; Their Location, Resources and Security; 2. The Denial of Bases; 3. The Security of Advanced Bases and Advanced Base Operations; and 4. The Advanced Base Force,” U.S. Naval War College Papers, Newport, RI, 1913; Jessop, Earl P., Captain U.S. Navy (Ret. ), “Repair Ships, Advance Bases, and Fleet Mobility in War Time,” U.S. Naval Institute Proceedings, August 1932; Carter, Worrall Reed, Rear Admiral U.S. Navy (Ret. ), Beans, Bullets, and Black Oil; the Story of Fleet Logistics Afloat in the Pacific During World War II, Department of the Navy, 1952; Ballantine, Duncan S., U.S. Naval Logistics in the Second World War, Naval War College Press, 1998 (reprint of 1947 edition by Princeton University Press); Kuehn, John T., Commander, U.S. Navy (Ret. ), Agents of Innovation; The General Board and the Design of the Fleet That Defeated the Japanese Navy, Naval Institute Press, Annapolis, MD, 2008; Irwin, Manley R., Silent Strategists; Harding, Denby, and U.S. Navy’s Trans-Pacific Offensive, World War II, revised edition, University Press of America, Lanham, MD, 2013; and Work, Robert O. [Colonel U.S. Marine Corps (Ret.) and Deputy Secretary of Defense], “To Take and Keep the Lead:” A Naval Fleet Platform Architecture for Enduring Maritime Supremacy, Center for Strategic and Budgetary Assessments, Washington, DC, 2005. For more on the concept of maneuver warfare see: Marine Corps Doctrinal Publication (MCDP) 1 Warfighting, Headquarters, US Marine Corps, 20 June 1997 (pgs. 72-76); for more on the differences between naval maneuver and naval movement see MCDP 1-0 Marine Corps Operations, Headquarters, US Marine Corps, 9 August 2011 (pgs. 2-20 – 2-22); Work, Robert O. [Colonel U.S. Marine Corps (Ret.) and Deputy Secretary of Defense], Thinking About Seabasing: All Ahead, Slow, Center for Strategic and Budgetary Assessments, Washington, DC, 2006 (pg. 59); and Wayne P. Hughes, Jr. Captain, U.S. Navy (Ret. ), “Naval Maneuver Warfare,” Naval War College Review, Summer 1997. Department of the Navy, Office of Naval Operations, The Logistics of Advance Bases, Base Maintenance Division OP-30 (OP-415), U.S. Government Printing Office, Washington, DC. See in particular: Carter, Beans, Bullets, and Black Oil, 1952, pp. vii-ix, 61, 90, 95-96.